This page provides descriptions of subjects of topical interest. Click on the links below to go to a hot topic. EPA's Accidental Release Prevention Rule (40 CFR Part 68) is commonly called the RMP rule. A key requirement of the rule is submission of a Risk Management Plan (RMP) to the EPA at least once every five years. RMPs contain information on the facility, worst case and alternative release scenarios, 5-year accident history, prevention program and emergency response program. When preparing an RMP for submittal, keep in mind that RMPs are publicly available, except any portion for which confidential business information (CBI) has been claimed. EPA is required to audit RMPs and determine any revisions that the EPA believes are necessary. The RMP rule requires that the public have access to these determinations. Thus, companies should emphasize their commitment to minimizing risks posed to the community. Process Safety Management (PSM) requirements for petroleum refineries from the California Department of Industrial Relations (DIR) provide an elaboration on what should be addressed for human factors in process hazard analysis (PHA) for which no definition or guidelines are provided in OSHA’s PSM standard. The design of machines, operations and work environments such that they closely match human capabilities, limitations and needs. Human factors include environmental, organizational and job factors, as well as human and individual characteristics, such as fatigue, that can affect job performance, process safety, and health and safety. DIR requires employers to develop, implement, and maintain an effective written Human Factors program which must include a written analysis of Human Factors, where relevant, in major changes, incident investigations, PHAs, management of organization changes, and hierarchy of controls analysis. The analysis must include a description of the selected methodologies and criteria for their use. Employers must include an assessment of Human Factors in new and revised operating and maintenance procedures. Employers must train operating and maintenance employees in the written Human Factors program and provide for employee participation in the Human Factors program. Employers must make available and provide on request a copy of the written Human Factors program to employees and their representatives and to affected contractors, employees of contractors, and contractor employee representatives. Various tools can be used to conduct such analyses and assessments including checklists, task analysis, and procedural PHA. Primatech’s PHAWorks RA Edition provides all these methods and includes human factors checklists. For information about performing human factors studies, please contact Primatech. Inherent safety approaches focus on eliminating or reducing the hazards associated with a process in a way that is permanent and inseparable from the process. The process of identifying and implementing inherent safety in a specific context is known as inherently safer design. Minimize: Use smaller quantities of hazardous materials. Substitute: Replace a hazardous material with one that is less hazardous. Moderate: Use less severe operating conditions. Simplify: Eliminate opportunities for errors by eliminating the need to add safeguards. Sometimes inherent safety measures are categorized as first and second order. First Order: A measure that eliminates a hazard, for example, by substituting a toxic chemical with an alternative chemical that can serve the same function but is non-toxic. Second Order: A measure that reduces the severity of a hazard or the likelihood of a release, without the use of add-on safety devices, for example, by redesigning a high-pressure, high-temperature process to operate at ambient temperatures and pressures. PHAWorks RA Edition can be used to perform Inherent Safety Reviews using a provided checklist. For information about performing Inherent Safety Reviews, please contact Primatech. Process Safety Management (PSM) regulations for petroleum refineries from the California Department of Industrial Relations (DIR) require that a PSCA be performed. A combination of group values and behaviors that reflects whether there is a collective commitment by leaders and individuals to emphasize process safety over competing goals, in order to ensure protection of people and the environment. Employers must develop, implement, and maintain an effective PSCA program. The PSCA must be developed and implemented by a team that includes at least one member knowledgeable in refinery operations and at least one employee representative. The team must consult with at least one employee or another individual with expertise in assessing process safety culture in the petroleum refining industry. Employers, in consultation with the PSCA team, must prioritize recommendations and implement corrective actions. PSCAs must be performed at least once every five (5) years. The PSCA team must conduct a written Interim Assessment of the implementation and effectiveness of each PSCA corrective action. If a corrective action is found to be ineffective, the employer must implement changes necessary to ensure effectiveness in a timely manner. The refinery manager or designee must serve as signatory to all PSCA reports, corrective action plans and Interim Assessments. PSCA reports, corrective action plans and Interim Assessments must be communicated and made available to employees, their representatives and participating contractors. Participating contractors must provide PSCA reports, corrective action plans and Interim Assessments to their employees and employee representatives. For information about performing PSCAs, please contact Primatech. Process Safety Management (PSM) regulations for petroleum refineries from the California Department of Industrial Relations (DIR) require that a DMR be performed and the results be addressed in process hazard analysis (PHA) studies. The mechanical, chemical, physical or other process that results in equipment or material degradation. Damage mechanisms may cause the failure of process equipment resulting in loss of containment or impaired operability of equipment. They may cause damage to equipment and materials that contain process fluids such as piping, pumps, and valves; equipment and materials that provide safeguards against process incidents such as fireproofing, dikes, and deluge systems; and equipment and materials in utilities and support systems whose failure may impact on or result in a process safety incident. Damage mechanisms can arise internally or externally such as from internal or external corrosion. Damage mechanisms should be addressed in PHA studies. However, the occurrence of incidents involving damage mechanisms has demonstrated that sometimes they are overlooked. Indeed, it is not common for PHA teams to identify specific damage mechanisms as a cause of equipment failure. DMRs must include an assessment of previous experience with the process, including the inspection history and all damage mechanism data; a review of industry-wide experience with the process; and all applicable standards, codes and practices. DMRs must be performed by a team with expertise in engineering, equipment and pipe inspection, damage and failure mechanisms, and the operation of the process or processes under review. The team must include one member knowledgeable in the specific DMR methodology being used. Employee participation must be addressed. Employers must implement DMR recommendations. DMR reports must be provided to and, upon request, reviewed with employees whose work assignments are within the process unit described in the DMR. DMR reports must be retained for the life of the process unit. DMRs must be revalidated at least once every five years. The DMR for a process unit must be available to the team performing a PHA for that process unit. As necessary, the PHA team must consult with individuals with expertise in damage mechanisms. DIR requires employers to complete a DMR for each existing and new process for which a damage mechanism exists. Where no DMR is performed, the employer must document the rationale for the determination that no damage mechanisms exist. DMRs must be reviewed as part of a major change on a process for which a damage mechanism exists, prior to approval of the change. If a major change may introduce a damage mechanism, a DMR must be conducted, prior to approval of the change. Where a damage mechanism is identified as a contributing factor in an incident investigation, employers must review the most recent DMRs that are relevant to the investigation. If a DMR has not been performed on the processes that are relevant to the investigation, the incident investigation team must recommend that a DMR be conducted and completed within a specified time frame. You can perform DMRs using PHAWorks RA Edition. For information about performing DMRs, please contact Primatech. Process Safety Management (PSM) regulations for petroleum refineries from the California Department of Industrial Relations (DIR) require that a HCA be performed and that PHAs address HCA reports applicable to the process. Hazard prevention and control measures, in priority order, to eliminate or minimize a hazard. 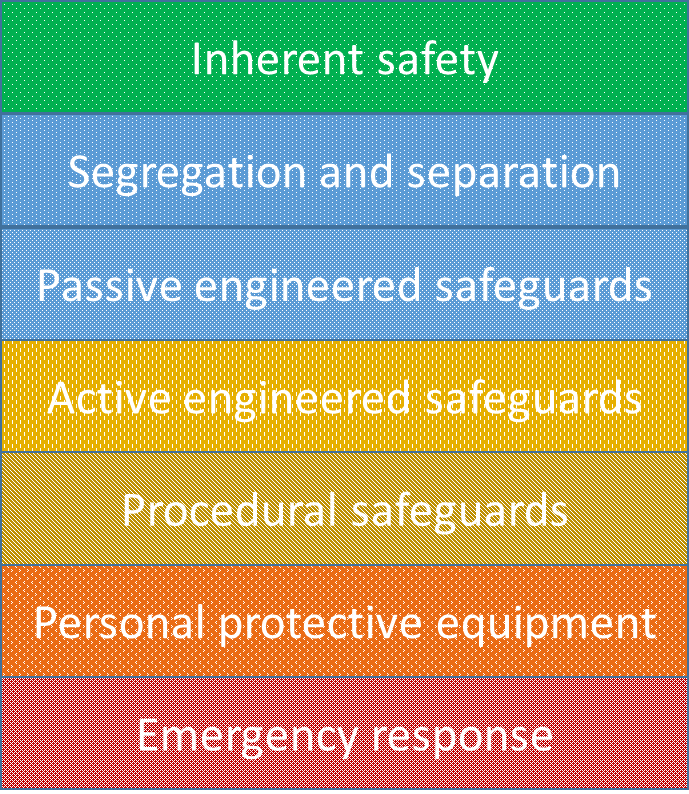 Hazard prevention and control measures ranked from most effective to least effective are: First Order Inherent Safety, Second Order Inherent Safety, and passive, active and procedural protection layers. DIR requires employers to conduct an HCA as a standalone analysis for all existing processes. For the HCA on existing processes, the team must review the PHA while conducting the HCA. All HCAs for existing processes must be updated and revalidated as standalone analyses at least once every five (5) years. HCAs must be documented, performed, updated and revalidated by a team with expertise in engineering and process operations. The team must include one member knowledgeable in the HCA methodology being used and at least one operating employee who currently works on the process and has expertise and experience specific to the process being evaluated. The employer must provide for employee participation. First order inherent safety measures are considered to be most effective and procedural safeguards are considered to be least effective. Identify, analyze, and document relevant, publically available information on inherent safety measures and safeguards. Employers must implement all recommendations and retain all HCA reports for the life of each process. For information about performing HCAs, please contact Primatech. Process Safety Management (PSM) regulations for petroleum refineries from the California Department of Industrial Relations (DIR) require that a SPA be performed. A device, system or action designed to interrupt the chain of events or mitigate the consequences following an initiating cause. Passive safeguards are process or equipment design features that minimize a hazard by reducing either its frequency or consequence, without the active functioning of any device; for example, a diked wall around a storage tank of flammable liquids. Active safeguards are controls, alarms, safety instrumented systems and mitigation systems that are used to detect and respond to deviations from normal process operations; for example, a pump that is shut off by a high-level switch. Procedural safeguards are policies, operating procedures, training, administrative checks, emergency response and other management approaches used to prevent incidents or to minimize the effects of an incident, for example, hot work procedures and emergency response procedures. An event within or affecting a process that causes a fire, explosion or release of a highly hazardous material and has the potential to result in death or serious physical harm. The SPA must utilize a quantitative or semi-quantitative method, such as Layers of Protection Analysis (LOPA), or an equally effective method, to identify the most protective safeguards. The risk reduction obtainable by each safeguard must be based on site-specific failure rate data, or in the absence of such data, industry failure rate data for each device, system or human factor. The SPA must document the likelihood and severity of all potential initiating events, including equipment failures, human errors, loss of flow control, loss of pressure control, loss of temperature control, loss of level control, excess reaction, and other conditions that may lead to a loss of containment. The SPA must document the risk reduction achieved by each safeguard for all potential initiating events. The SPA must be conducted by at least one individual with expertise in the specific SPA methodology being used. The SPA may be performed as part of the PHA or as a stand-alone analysis. The employer must provide for employee participation in the performance of all SPAs. As necessary, the PHA team must consult with individuals with expertise in SPA. You can perform SPA using PHAWorks RA Edition or LOPAWorks. For information about performing SPAs, please contact Primatech. Many facilities manufacture materials in the form of powders and some facilities generate powders through handling and processing solid materials. Such facilities may be subject to combustible dust hazards. A combustible dust is a finely-divided particulate solid that presents a flash-fire hazard or explosion hazard when suspended in air, or another oxidizing medium, over a range of concentrations. A wide variety of industries pose combustible dust hazards from various materials including chemicals, metals, wood, plastics, rubber, coal, flour, sugar, and paper. In 2008, the U.S. Occupational Safety and Health Administration (OSHA) reissued its combustible dust National Emphasis Program (NEP), CPL 03-00-008, and OSHA has been engaged in rule making on a combustible dust standard. In 2015, the National Fire Protection Association (NFPA) published NFPA 652, Standard on the Fundamentals of Combustible Dust (2016 edition). The standard requires a dust hazard analysis (DHA) which is a systematic review to identify and evaluate the potential fire, flash fire, or explosion hazards associated with the presence of one or more combustible particulate solids in a process or facility. The purpose of a DHA is to identify hazards and document how those hazards are being managed. The hazards addressed by NFPA 652 are fire, deflagration, and explosion hazards of combustible dusts. The results of the DHA are documented, including any necessary action items requiring change to process materials, the physical process, process operations, or facilities associated with the process. For information about performing DHA, please contact Primatech. Simultaneous operations (SIMOPs) are situations in processes where two or more operations or activities occur at the same time and place. They may interfere or clash with each other and may involve risks that are not identified when each activity is considered by itself. Thus, they can increase the risks of the activities or create new risks. Simultaneous operations often involve work in the same area by multiple contractors and subcontractors or multi-disciplinary workers whose work may overlap and/or interact. For example, construction activities near active equipment such as crane lifts over a storage tank containing a toxic material may result in a release from dropped objects. Similarly, a maintenance activity near another process operation such as hot work in the vicinity of a tank truck unloading a flammable material may result in a fire. A number of major process industry accidents have involved simultaneous operations. The situations addressed by SIMOP studies usually are not considered during process hazards analysis (PHA) studies which focus attention on individual process operation. Furthermore, PHA teams may not recognize the importance of examining how simultaneous operations may interfere with each other. Moreover, it is difficult to do so within the constraints of a regular PHA study. A SIMOP review identifies possible interactions between activities that may adversely impact people, property, or the environment. SIMOP reviews are an important adjunct to the performance of PHA studies such as hazard and operability (HAZOP) studies. For information about performing SIMOP studies, please contact Primatech. PHA studies largely are performed to comply with government regulations and industry good practices. However, they contain a wealth of information that can be mined for a variety of other purposes. For example, critical equipment and human actions can be identified, process risk profiles can be developed, insights into incident causality can be obtained, the relative contributions of safeguards to risk reduction can be determined, and the impacts of bypassing safeguards can be determined. Many companies have performed large numbers of PHA studies for their processes. They contain data on hazard scenarios that can occur for the processes. These data can be mined to provide knowledge-based tools to facilitate the performance of further PHA studies. PHA studies require the investment of considerable resources. Consequently, the effort to utilize the information they contain for as many beneficial purposes as possible is well warranted. For assistance with PHA analytics, please contact Primatech. People perform PHA studies and, therefore, such studies are subject to various possible human failures. Studies are difficult and time-consuming activities that place significant demands on participants which increases the chance that errors will be made. Many human factors influence human failures during PHA studies. Human factors such as willingness to rely on the unsubstantiated opinions of others; groupthink; underestimation of the frequencies of low-probability, high-consequence events; and allowing a false sense of accomplishment to distract from implementing study results must be recognized and addressed. Human factors issues during the preparation, conduct, recording, documentation, and follow-up of studies can influence their quality markedly. Furthermore, PHA often is viewed as an objective engineering analysis. However, in reality, PHA is based largely on subjective judgments by team members. Recent research has identified various psychological factors that influence the decisions made by PHA teams. In particular, cognitive biases influence human decision making and people largely are unaware that they do so. Competent PHA facilitators must understand the impact of human and psychological factors on PHA studies because they can seriously impact the quality of study results. Hazard scenarios may be missed, risks estimated incorrectly, and important recommendations omitted. For assistance with human and psychological factors in the performance of PHA, please contact Primatech. The ability of people to perform tasks according to expectations, or the competency of personnel, is crucial to every organization because of the role it plays in ensuring tasks are carried out satisfactorily and safely. Competency implies appropriate qualifications, training, skills, physical and mental capabilities, knowledge, understanding, behavior and attitudes as well as the ability to perform tasks according to defined performance standards. Competency should be managed, otherwise poor performance and accidents may result. Indeed accidents have occurred when competencies other than knowledge and experience were absent. Competency management is particularly important when an organization relies heavily on the skills, knowledge and capabilities of its personnel, such as in the process industries. The importance of competency is compounded in the face of the re-engineering, downsizing, and multi-tasking that can occur in the process industries. Personnel are often expected to take on a wider range of tasks with less supervision thus increasing the need to manage competency effectively. Competency management should be part of an organization’s overall management system. It should apply to personnel from the top to the bottom of the organization and include contractors and others who perform work within the organization. For assistance with competency management for process safety, please contact Primatech. Manufacturing and process plants use computer systems to control manufacturing processes, store information, and manage value chain activities. All these computer systems can be attacked by cyber means and used to cause harm. Cyber attacks can result in the manipulation of control systems, loss of control, process shutdown and other impacts. Hazardous materials may be released, products may be contaminated, production may be interrupted, and equipment may be damaged. Increasingly, manufacturing and process control computer systems are connected to business, commercial and enterprise networks that in turn are connected to the Internet. Process control systems may also contain computers with connections to the Internet, or modems for remote access. These connections with the outside world provide the means for attackers to penetrate the systems and cause harm. Also, the potential exists for manipulation of control systems by people acting from inside a company. Cyber security vulnerability analysis identifies ways specific threats can be realized (called cyber threat scenarios) in a similar way to identifying hazard scenarios in a process hazard analysis (PHA). A threat scenario is a specific sequence of events that has an undesirable consequence resulting from the realization of a threat. It is the security equivalent of a hazard scenario. For information about performing CSVA studies, please contact Primatech. ENVID studies are used to identify environmental impacts posed by processes or facilities. They parallel HAZID studies that identify the hazards posed by processes or facilities. ENVID studies are performed to comply with environmental regulations, best available technology for environmental emissions control, and company objectives. ENVID studies help to determine how the process design may be altered to eliminate or mitigate possible environmental impacts. Safeguards are identified that address these impacts and recommendations are made so that they are kept as low as reasonably practicable. As with HAZID studies, ENVID studies first should be performed during early process design when design changes can be made with minimal cost impacts. ENVID studies also are important when process changes are made that may pose environmental impacts. These studies should address all stages in the life of a process from commissioning, through operation, to decommissioning, and cover all modes of process operation. For information about performing ENVID studies, please contact Primatech. EPA has finalized amendments to its RMP regulation in response to Executive Order 13650. Primatech has created a series of PT Notes on this subject which can be accessed by clicking here. OSHA has solicited comments on possible changes. Primatech has created a series of PT Notes on this subject which can be accessed by clicking here.